On September 22, Pope Francis visited the Gate of Dawn in Vilnius, Lithuania, a shrine famous for its centuries-old devotion to the Blessed Virgin Mary the Mother of Mercy and one which continues to attract pilgrims from all over the world. Gathered to pray the Rosary with the Pope were large families and other families that provide foster care or have adopted or are seeking to adopt children, and also orphans and sick people. Many other people from Vilnius and guests of the city filled the surrounding areas, as far as Town Hall Square. More than 2,000 people took part, according to estimates. On arriving, the Holy Father was met by Archbishop Gintaras Grušas. The cortege stopped not far from the gate to the Russian Orthodox Church of the Holy Spirit, where Metropolitan Innocent, Archbishop of Vilnius and Lithuania, and Monsignor Kęstutis Latoža, pastor of the Gate of` Dawn chapel, greeted the Pope. Walking along Gate of Dawn Street, Pope Francis passed close by about a thousand of those who were gathered, greeting and blessing them and speaking with some. He paused beside Evangelical Lutheran Bishop Mindaugas Sabutis and his family, whom Archbishop Grušas presented to the Pope. At the Gate of Dawn, the Pope approached the sick and the people with disabilities who had come from all over Lithuania, and then entered into the Chapel of Our Lady of Mercy. 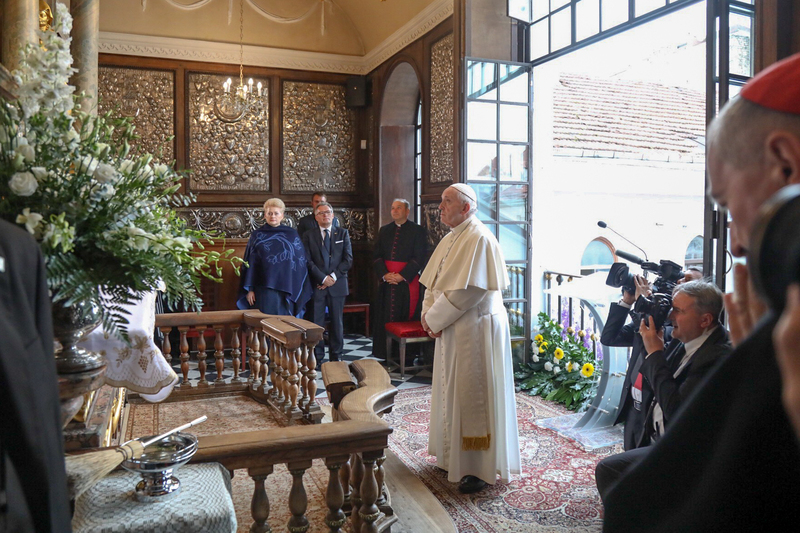 Lithuanian president Dalia Grybauskaitė and the papal entourage awaited the pope in the chapel. The pope said that when we close ourselves off out of fear, “when we build walls and barricades, we end up depriving ourselves of the Good News of Jesus,” which guides history and our lives. He encouraged us to walk together in peace and experience the value of brotherhood and sisterhood. Having emphasized that this site is visited by Christians from various countries, he expressed a wish that we share our gifts with one another and offer ourselves to others. Pope Francis reminded us that the Mother of Mercy, like any good mother, attempts to unify her family and, whispering in everyone’s ear, “Look for your brother, look for your sister,” she leads us to the doorstep where children and families with bleeding wounds, Jesus’s real wounds, wait for us today. After speaking, the pope made the sign of the cross and prayed the third joyful mystery of the Rosary, “the Nativity”, in Lithuanian together with everyone. It was prayed in petition of joy, hope and peace for Lithuania and all the world. The Rosary was jointly led by three orphans, three disabled persons, and four members of foster families. After the Rosary, the Pope glanced at the image of Mary and read a prayer in Latin to Our Lady of the Gate of Dawn. The Rosary and the prayer after it were broadcast live to Cathedral Square, where the young people awaiting Pope Francis’s arrival there also prayed along. Pope Francis left a gift beside the image of Mary and blessed a new crown for the Blessed Virgin which Lithuanian jewelers fabricated from the ex-votos (thanksgiving offerings, often made of precious metals) of people who prayed at the chapel. He also gave a blessing to all those gathered. The Holy Father departed by popemobile to Cathedral Square, where young people awaited him.